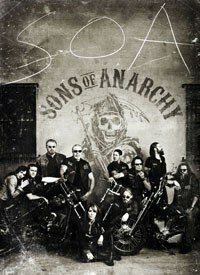 Sons of Anarchy actually lives and dies on its dialogue-heavy scenes, rather than its action sequences. Season four premieres tonight. For a little while, back in 2009, Sons of Anarchy looked like it had made the leap to being one of the best dramas on television. The show’s second season was a triumph that delivered every week, and finished with a cliffhanger that portended ominous things for Season Three. As great as that plot turn was, it turned out to be an anchor that dragged the next year down. The entire season turned on when the titular motorcycle club would go to Belfast to find ostensible main character Jax’s kidnapped baby. But the show didn’t make its way across the Atlantic until after the halfway point of the season. Famously independent-minded creator Kurt Sutter made the curious decision to let the audience know the baby was in Northern Ireland long before the Sons themselves discovered this crucial piece of information. This had the effect of making every other storyline seem a delaying tactic to keep the Sons in Charming until it was time to finish the baby plot. The show didn’t suddenly go from excellent to bad during Season Three. But its pace and detail didn't measure up to those of the previous year. The season ended by wrapping up many long-running subplots while sending most of the club members to prison for 14 months. This allows Season Four to start more or less fresh, picking up on the day the Sons are released. As they ride back into Charming, the new sheriff in town (Rockmond Dunbar) stops them. The Sons’ cuts (sleeveless leather jackets), he says, are considered gang colors, and if he sees any of them wearing them in town again, he’ll confiscate them. Also new to town is Lincoln Potter (Ray McKinnon), an Assistant U.S. Attorney who has been working up an organized crime case involving the Sons, the IRA, and the Russian Mafia. Potter is a bit of an oddball, quiet and contemplative. He favors leather jackets and long hair over typical attorney attire. But he knows his stuff, and fancies that he knows how the Sons think. As he brings Sheriff Roosevelt into his investigation, he reveals to him (and the viewers) that he’s worked out the complex chain of events that ultimately landed the Sons in jail, and what he expects to happen next, now that they’re out. It doesn’t go down quite the way he imagines, of course. The Sons are nursing grudges and have payback on their minds, especially concerning their Russian partners. And the club’s old enemy Jacob Hale (Jeff Kober) has moved forward with his plans to build a new, expensive development full of McMansions in town. Sleazy and underhanded and responsible for a lot of bad things, Hale wants to run Charming his way and make a lot of money in the process. Really, this doesn’t make him all that different from the Sons. They see themselves as protectors of a small-town way of life, as they keep Charming safe from things like big box stores and fast food chains. But mostly what they want is to keep running things the way they have for the past three decades. That was easier to do when they had the chief of police in their pocket and the richest man in town owing them a debt. Now that Hale is the mayor of Charming and the sheriff is a straight shooter, the town isn’t quite as accommodating to the local motorcycle club. That’s a lot of plot to deliver in one episode, which is why the season premiere is 90 minutes long and very talky. But Sons of Anarchy -- much like its spiritual predecessors The Shield and Deadwood -- actually lives and dies on its dialogue-heavy scenes, rather than its action sequences. With Sutter scripting the season premiere, that dialogue is compelling throughout the extended running time. The battle for control of Charming looks to be the new season’s main thrust, which puts Sons of Anarchy back on firm, albeit familiar, ground. Also back on the table is the issue of the club's future, as Clay’s (Ron Perlman) arthritic hands continue to deteriorate. When he can no longer ride, he’ll have to step down. Jax has been waiting years for the opportunity to take over the Sons and run things his way, but that year-plus in prison has changed his priorities. Being away from his two small children and steady girlfriend Tara (Maggie Siff) has clarified what’s most important to him, and it’s no longer the club. This is an interesting direction change for the show itself, too, as it was originally set up as a battle between Jax and Clay for the soul of the Sons of Anarchy. Now Jax tells Tara that he has a plan for getting out. We all know how well the “I’ll just pull one last job for a big score and then I’m out” strategy works for criminals in the movies and on TV. The show presents Jax’s attitude as simultaneously intelligent and misguided. Jax admits he has no real skills, that at best he’s “an okay mechanic.” But his pride won’t let him just go and live off of Tara’s income for a while, despite the fact that she’s a surgeon. Jax just can’t wrap his head around the idea of letting his woman support the family, so he’s going for the big money instead. Jax’s plan threatened by the Mexican drug cartel the Sons have taken on as their new clients. Selling them guns is lucrative, but the Mexicans want all of the Sons’ weapons supply and worse, they want the club to mule drugs for them as well. The motorcycle club has always drawn a fine distinction between their criminal activities. Arms dealing is fine, that’s what they do, but many of them draw the line at drug trafficking: this causes a significant ideological divide among the members. The inclusion of the Mexicans in the show feels topical and organic. It makes sense that the Sons, on the verge of becoming major players in the gun-running business, would end up making contacts in that world. It helps too that Danny Trejo plays the cartel's representative in northern California, as he brings to bear his well known combination of affability and menace. The series seems set on keeping the Sons in and around Charming. Hale’s land development plan has been in the works since Season Two, and it’s time for the show to address it head on. Having a black sheriff in town is already paying off in the storyline by forcing the Sons to face some uncomfortable truths. Roosevelt is using the fact that the Sons have apparently never had any African American members to his advantage. So far, there’s no indication that there’s enough brewing here to measure up to Season Two, but the show seems to be solidly back on track after the problems of Season Three.